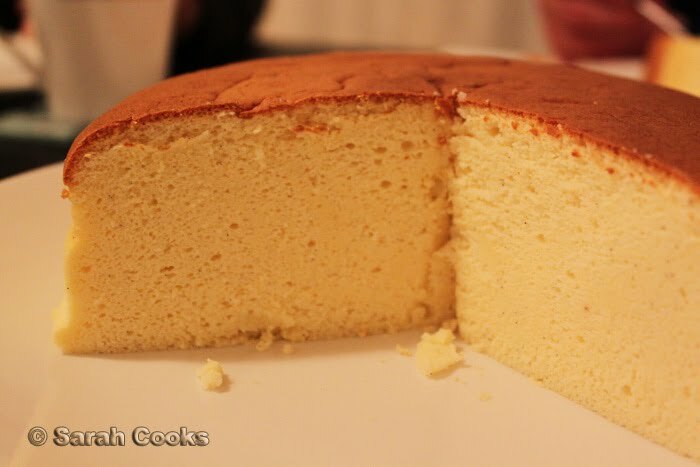 When my dad requested a cheesecake for his birthday, I took the opportunity to try out a new type of cheesecake, one that I hadn't baked before. I knew that a rich and creamy European baked cheesecake would be too filling after a big meal, and I thought a better option would be the light and fluffy cheesecakes I loved in Japan! I didn't have my own recipe, so did a bit of googling, and came across this one from Diana's Desserts that got some good reviews. Another blogger made it and her version looked pretty tempting, so I was quite confident it would turn out ok. The main differences between this cheesecake and a standard European/NY baked cheesecake is that the Japanese version is crustless, it uses less cream cheese, and that it has a whole lotta whipped egg whites for lightness. It is super, super fluffy! I don't normally print recipes, but I've included this one below, as it has been re-printed on blogs before, and I've adapted it slightly for my tastes. If you're good with egg whites and water baths, then this recipe will be a no-brainer for you! I baked the cake on a Sunday, and we ate it late the next night (after the epic Kenzan dinner). 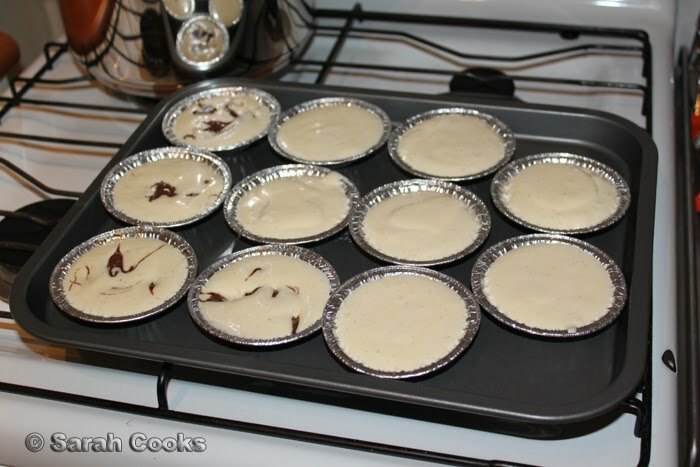 However, we did get to sneak a few tastes on Sunday night - there was too much batter for the 20cm tin I used, so I made mini cheesecakelets with the remainder. As you can see, I swirled Nutella into a few of them as well. They only needed about 15 minutes to bake through. I didn't think we'd finish all of these, but between Sandra and myself, we ate ALL of them in front of the TV in less than an hour. Oops. In our defence, they're really small and super-light! 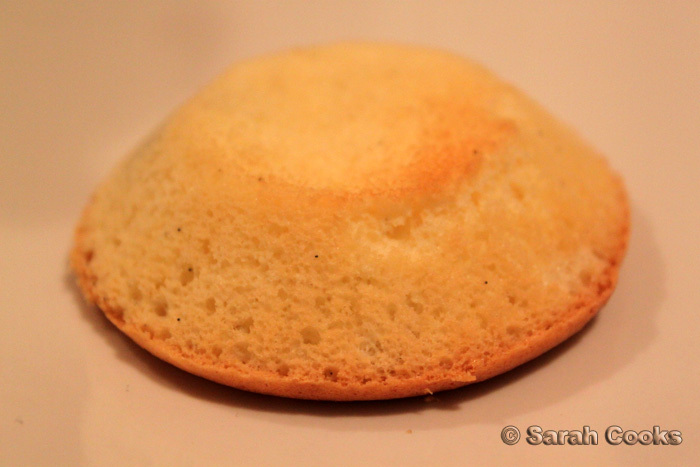 In the miniature, they taste almost like chiffon cake, with the slightest hint of cream cheese. Dangerously easy to eat. 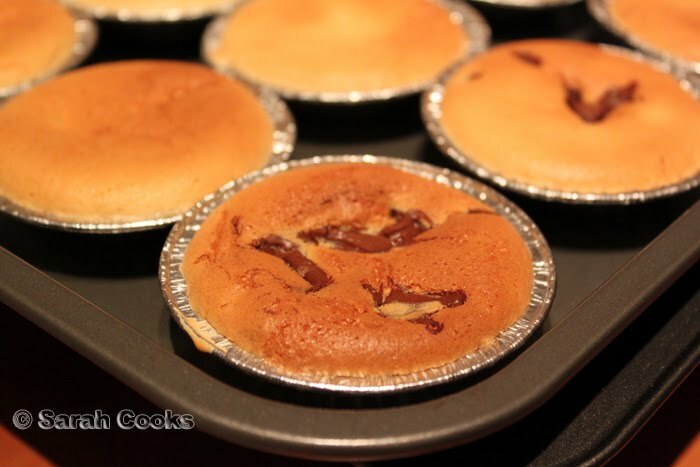 The flavour and texture were both super-light, so the nutella ones were overpowered by the nutella flavour. I'd definitely skip the nutella next time. Now, as for the actual cheesecake! We had it with tea after our huge dinner (green tea would be very appropriate here), and it was a huge success. Yay! It was moister than the mini-ones, and had a stronger cheesecake taste. After slicing, the pieces tended to dry out quite quickly, so unlike regular cheesecake, I'd recommend eating all of the cheesecake as soon as possible. Not that that'll be a challenge, trust me! Split the vanilla pod in half lengthwise and scrape out the seeds. 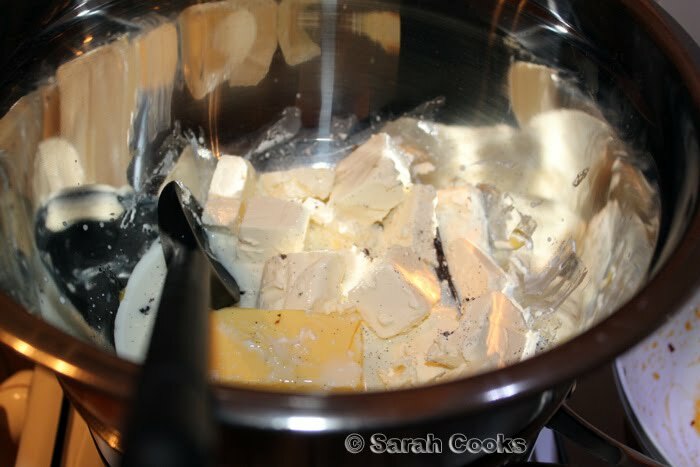 Place pod and seeds (or vanilly extract) into a double boiler, and add the cream cheese, butter and milk. Place over a low heat, stirring frequently until melted and amalgamated. Remove the vanilla pod and discard. Cooking point! Make sure the mixture is super smooth, without any lumps. Allow the mixture to cool. 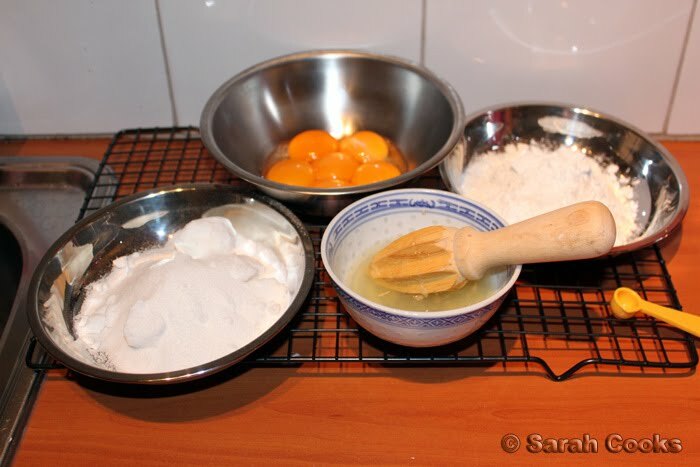 Add in the flour, the cornflour, egg yolks, lemon juice and salt. Mix well. 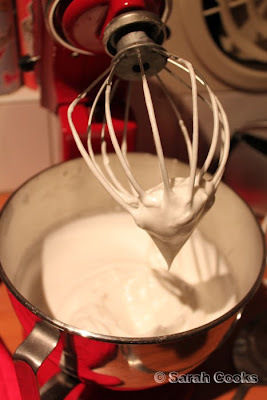 In a clean bowl, whisk egg whites until foamy. Add in the sugar and whisk until soft peaks form. 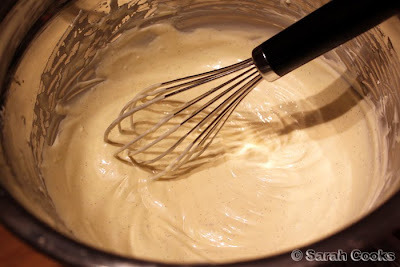 Gently fold the egg whites into the cream cheese mixture, in 2 batches. Mix the egg whites in gently but thoroughly, so that you can maintain the volume whilst ensuring there are no white streaks left in the batter. 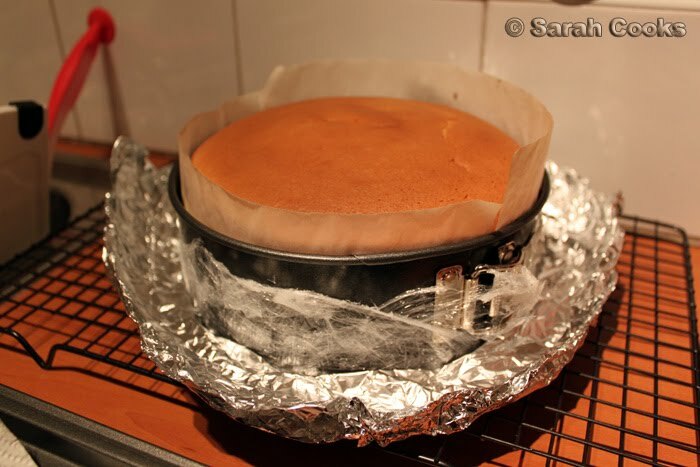 Line a deep 20cm springform tin, or a standard 23cm springform tin with greaseproof paper. 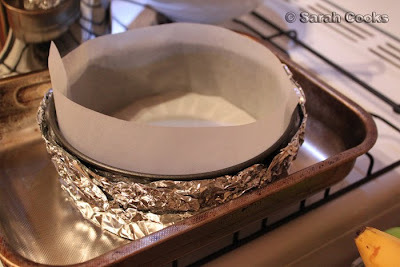 Wrap the outside of the tin in 2 layers of cling wrap, and 2 layers of foil. The glad wrap isn't strictly necessary, but the idea is to create a waterproof barrier. For the record, I've never had cling wrap melt in the oven, and I find that it always comes away easily from the tin after baking. However, I can't make any guarantees for all brands of cling wrap - try this at your own risk! Place the prepared cake tin into a roasting tray and pour in the batter. Pour water from a recently boiled kettle into the tray, to come halfway up the side of the tin. Bake in an oven preheated to 160C for 1 hour and 10 minutes, until set and golden brown. Take it out of the waterbath straight away, and as soon as it is cool enough to bear, peel away the foil and gladwrap. Let the cheesecake cool in the tin on a wire rack. This looks really good. I'm sure my cheesecake loving boy would be very very happy if I made this! Oh. My. God. WANT. Must kill my fear of waterbaths to make this thing. Must. Awesome. I have been wanting to bake this for awhile. Have about 3 recipes and am studying it for I will not destroy it. One of my favourite cake in the world. This looks soo good! Can you tell me where you get your cake flour from? I have only found it at the USA food store in Moorabin but somewhere more convenient would be good! Gemma- Thank-you! I'd definitely suggest giving it a go; it's so deliciously light and fluffy! Esz - I'm a bit iffy about waterbaths too, hence the quadruple layering! First time I did a waterbath, about 5 years ago, some water leaked in, so I took the sides off the springform tin and put the cheesecake back into the oven "to dry it out". Then the whole thing COLLAPSED and made a huge mess all over the oven! I was devastated. (Although we just ate the rest with spoons hehehe). Penny - Can't wait to see your version! Wymsio - Thank-you very much! I find cake flour at my local Safeway and Coles. It's the Lighthouse Brand "Cake, Biscuit and Pastry flour" in the blue box. They make pizza/bread flour too. Although I think you could use normal flour without detriment to the cake. You have great height on your cake and it looks so light. Love it! 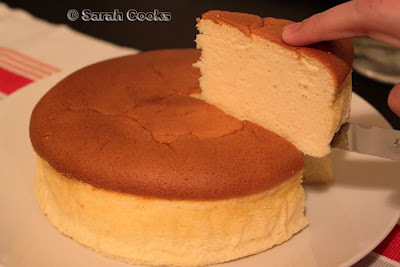 It looks just exactly like the Jap Cotton Cheesecake sold here. Good job! your cheesecake has risen so evenly. sounds like this recipe is one to keep!! That looks wonderfully fluffy and light; and so yum tooooo!!! YUM! This looks so light and fluffy! Not really a cheesecake like I know it but still, sounds great. Might add this to my long list of recipes to try :) Lemme know if you do a matcha version! Looks really good and I will like to try it. One of my frends tried making these Jap Cheesecake and she said that they always collapsed when cooled. Do you know why they collapsed and any tips to avoid it? The cheesecake will always sink a little because it has so much air in it! To help avoid it sinking a lot, your friend has to be careful whipping the egg whites (making sure the bowl/whisk is COMPLETELY dry before adding the whites). Also, must be careful folding the whites into the rest of the mixture so you don't knock the air out of it. Finally, be careful not to knock the cake tin itself. 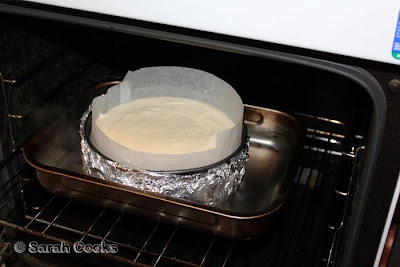 And when you take it out of the oven, make sure you don't put it anywhere very cold or in a draught. i am thinking of putting it in a mould like a pikachu soft plastic mould, du think when it ocmes out it will hold the shape? 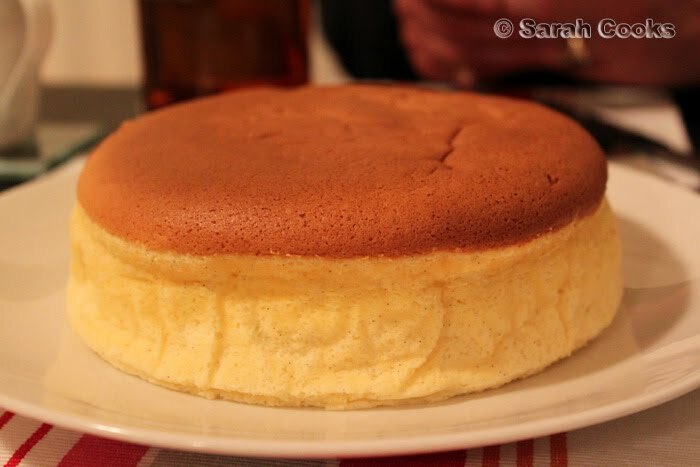 Anonymous - the Japanese cheesecake is highly fragile, and tends to sink after being baked, so I don't think it would be a good option for a shaped cake mould. I tried the recipe but somehow the bottom part of my cake is still gooey. And the top is slightly hard and crusty. Oh dear, what happened? It was amazing! I enjoyed it chilled best. 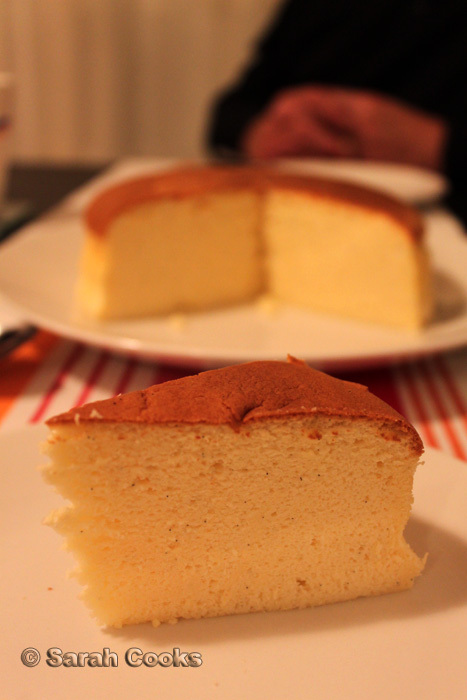 It also reminds me of cheesecake I've had in Japan, so great recipe. Thanks!